On 28 October 2016, the DANDELION project was presented at the “Social Growth on Trafficking and Immigration” (SOG-TIM) workshop. Held at the premises of the European Commission in Bratislava, the main goal of the workshop was to spark new and sustainable ways to address the key challenges surrounding the issue of refugee crisis and migration. 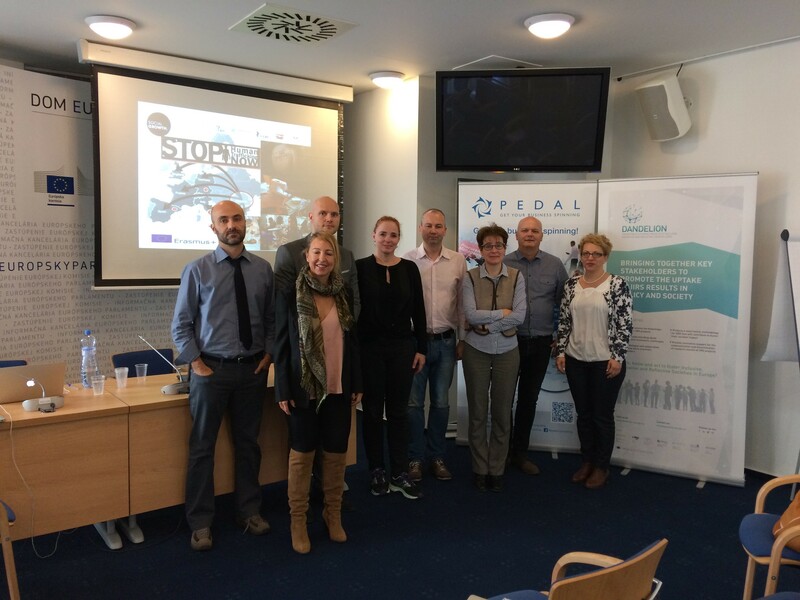 Besides the six partners of the SOG-TIM project, several key Slovak stakeholders joined the workshop to work on the common goal. These included government representatives (Ministry of Employment), UN representative (International Organization for Migration), a number of charitable and social inclusion oriented NGOs (Caritas Slovakia, Slovak Humanitarian Council, OZ Marginal, ADRA) and a representative of economic think tank (INESS). The interest in the project was also expressed by the League for Human Rights and NGO CVEK. The dense program began with the informal networking lunch, which was followed by introduction of the SOG-TIM project and team and introduction of the Slovak experts. The core program consisted of several brainstorming sessions. First, the participants identified the most important challenges – basic needs of refugees (food, shelter), labor opportunities, and social connection with the local communities. Second, the participants grouped in three teams to tackle each of these areas. There were no limits on possible solutions, so a dozens of improvements were quickly generated by the participants in all three fields. In the following steps, the solutions were narrowed down to a single one for each of the three areas. The teams then went on to work on the sustainability of these solutions, pitching the ideas in each round to the members of the other two teams. Self-sustaining projects are difficult, but possible – each team came up with at least one solution. However, an initial capital (money, real estate, or equipment) injection is needed most of the times. The whole programme went in a very swift way and the format of workshop was a novelty to all participants. All of them stated their interest to remain informed and involved in the future activities of SOG-TIM.